London: Sphere Books LTD, 1990. 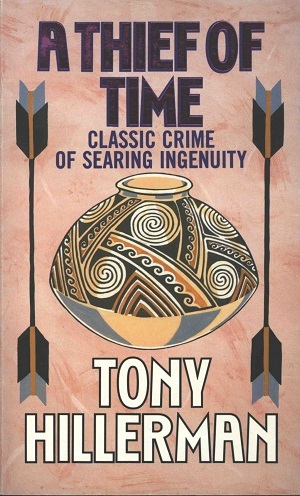 This is the second paperback United Kingdom edition of A Thief of Time, published in 1990 by Sphere Books Ltd, in London, England. The cover design is by Lesley Howell and features a polychrome ceramic vessel with a swirling pattern framed on two sides by double-ended arrows. Format: Paperback, 17.8 x 10.7 cm. Binding: Full-color paper covers with the title, author and publisher's logo printed in white vertically on the spine.